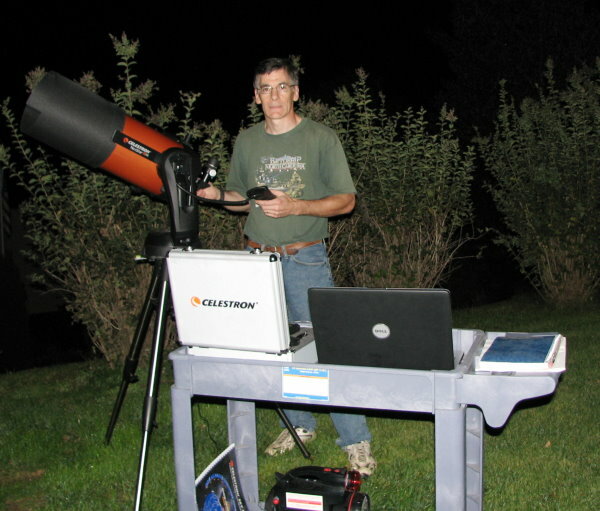 Amateur astronomy is one of those hobbies in which I participated avidly for the four years in the U.S. Air Force and for a couple years after separating. During that time I observed as often as time and atmospheric conditions permitted. 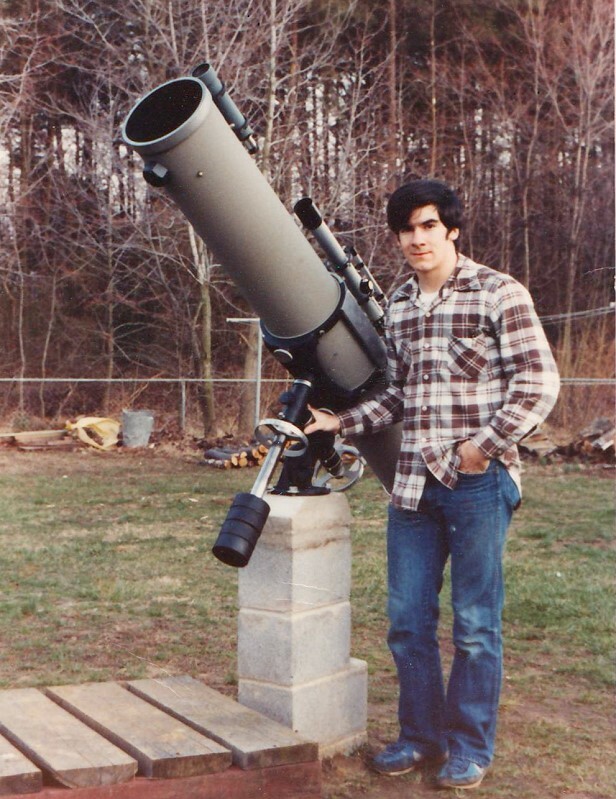 While at Robins AFB, in Warner Robins, Georgia, I belonged to the Macon Amateur Astronomy club and spent quite a few Friday evenings operating the museum's / club's 8", 10" and 14" Celestron telescopes both for private observation and for assisting the public after the planetarium show. The club took a couple trips to the Fernbank Science Center in Atlanta and got to look through their 32" reflector, which at the time (circa 1980) was the largest reflecting telescope in the southeast. Today, of course, private 30" Dobsonians are as affordable as motorcycles. A picture of me and my 8" Newtonian reflector (Criterion Criterion RV−8 Dynascope) is given to the right. I ended up selling it after getting married to help pay the mortgage (sold all the R/C stuff, too). I designed and built an electronic focuser for it using an R/C airplane servo and handheld control box. Only naked-eye (no longer anywhere near my former 20/15 vision) and my trusty binoculars remain for observing over the past 20 years. Recently, have I begun re−acquiring some of my "toys" from yesteryear. I have not purchased another telescope yet, but the good thing is that now the state of the art is orders of magnitude better than where I left off. Here I am (Kirt Blattenberger, webmaster, to right) with my 8" Newtonian reflector, circa 1982. It was purchased used from an astronomy shop in Baltimore, MD. After struggling with dragging out the tripod and doing polar alignments night after night, I finally got smart and built this concrete block pier and ran 120 VAC to it for the clock drive. The pier cap I custom cast out of concrete to mate the equatorial mount to the blocks. Observation nights were greatly increased in number after doing so. The finder is a piggybacked 2" Tasco refractor. I made a remote focusing mount for the eyepiece using a servo from one of my other hobbies - model airplanes and rockets. Soon, I will scan and post some of the photos I took with it using my Minolta SLR. There were no digital cameras in those days. Skip ahead nearly three decades, and here I am in my back yard in Erie, Pennsylvania, "playing" with my newly acquired (in June) Celestron NexStar 8SE telescope. City lights are fairly bright here to the east and west, but farm land is to the south and Lake Erie begins two miles to the north, so that limits the light pollution somewhat. Erie is not that large of a city, so that also helps. Still, compared to the truly dark skies in areas I have lived in Vermont and Colorado, the seeing is noticeably bad. I haven't had a chance to try any of the filters that came with the eyepiece and filter kit that came with the scope.